Liquid Rubber is truly a unique breakthrough in the rubber field. For the first time we are able to get 100% pure EPDM rubber in liquid form to cure without vulcanizing; that is applying high heat and pressure at the same time, which is what the manufacturer did when your boat was made. The consistency of honey, Liquid Rubber "paints" on to form a seamless, leakproof membrane of pure rubber. Can be used on PVC/Polyurethane and Hypalon fabric inflatable boats. Keep in mind that it's better to have extra for touch-ups later, than to run out part-way through your paint job. Since the original skin of most inflatable boats is 4-6 mils thick, Liquid Rubber truly renews and restores your boat to its new condition, even if your boat has lost some of its outer skin and even if the fabric is showing through. Use Liquid Rubber to spot repair or reinforce those heavy wear spots before they wear through, or re-skin the entire boat with Liquid Rubber to add years of serviceability to your boat. Liquid Rubber can be used again and again in the future to restore your boat's original look. Available in three (3) colors to help match your original inflatable skin color. Can I paint Liquid Rubber? Liquid Rubber comes in three colors. Grey (the color of many new inflatables), Black, and White. You may not want or need to paint your inflatable after you use Liquid Rubber to re-skin it. However, if you do want to paint it, especially if you want to change the color, you should use our Topside Paint. Our Topside Paint is mixed with our Sealant to provide an extra bond and seal for your inflatable. 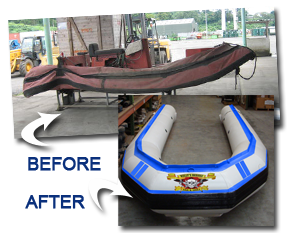 Elasticity is important when painting an inflatable boat and Inland Marine's Topside paint exceeds these requirements. Your inflatable boat will expand and contract when it is exposed to the sun and shade. If the paint you use does not have the elasticity to adjust to these changes, it will crack and peel. We provide Topside Paint in seven (7) colors so you can paint your boat, or creatively make it unique and easier to find when in a busy port of call. See more details here. If you need to restore your inflatable to cover abrasions, and add an extra layer of protection to the old fabric of your tubes, we recommend that you use our Liquid Rubber product first before you paint your inflatable with Top Side paint. This will make the surface of your inflatable like new. Many of our customers have used Liquid Rubber and our Top Side paint to repair and restore inflatables that were 10 to 15 years old. 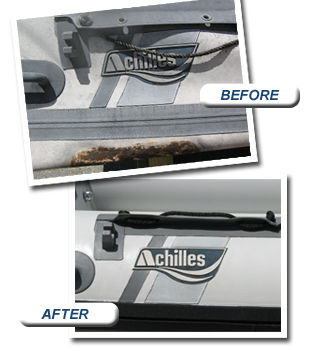 If your inflatabe boat has slow leaks (loses air over a day or 2) use our internal tube sealant. It works wonders. (3) Paint It (using Top side paint) If you're applying our Top Side paint over the Liquid Rubber also, wait the 7 days of curing before applying the Top Side paint. If you choose to do the 3-step process, buy everything you need in our Restoration Kit and save money overall. If your inflatabe boat has slow leaks (loses air over a day or 2) use our internal tube sealant. It works wonders. 1. Sand (abrade) the area to be treated. A 3m or Scotchbrite pad is best but sandpaper works too. 2. Clean the area to be treated well with a solvent such as Acetone or MEK (use safety precautions when using solvent). 3. Mix the Liquid Rubber with the catalyst provided. 4. Paint it on! Liquid Rubber will "flow" to form a smooth finish of pure rubber. 5. Dries to the touch in 24 hours - cures completely in about seven days depending on conditions. If you're applying our Top Side paint over the Liquid Rubber also, wait the 7 days of curing before applying the Top Side paint. 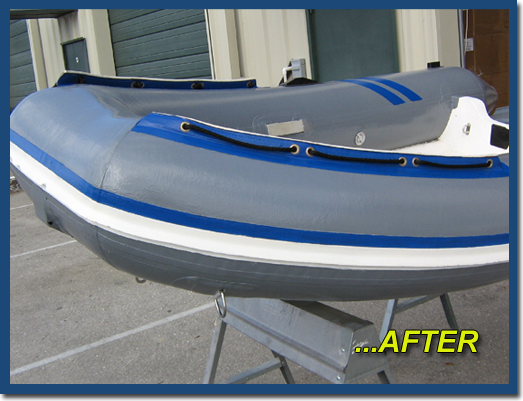 Older inflatable boats can look and work like new. Liquid Rubber is designed to Re-Skin you inflatable boat, kayak, raft or tow toy. 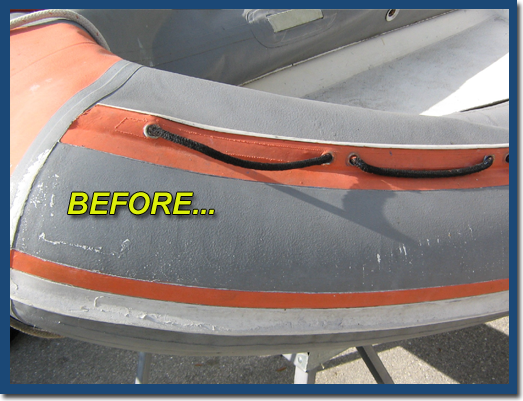 Years of use can wear the outer surface of your inflatable; abrasion and UV exposure can make your boat look bad and can cause slow leaks. Liquid Rubber is truly a unique breakthrough in the inflatable boat repair industry. For the first time we are able to get 100% pure EPDM rubber in liquid form to cure without vulcanizing. Vulcanizing is the process manufactures use to manufacture your inflatable. Liquid Rubber will adhere to your inflatable with the same reliability of vulcanizing but you do not need any heat. Just paint it on and it flows like honey, self levels for a smooth factory like finish. When applied properly, Liquid Rubber provides a 4 to 6 mil think coating of rubber over the existing fabric and rubber on your inflatable. 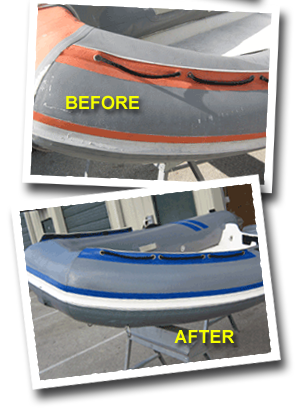 Liquid Rubber will provide your inflatable boat with years of new life. 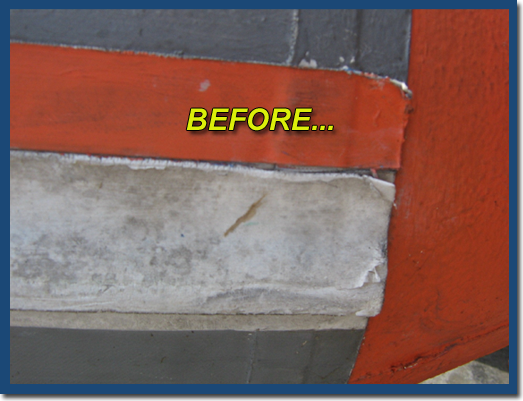 Liquid Rubber can be used again and again in the future to restore your boats original look. Available in three (3) colors to help match you original inflatable skin color. Liquid Rubber comes in three colors. Grey (the color of many new inflatable), Black, and White. 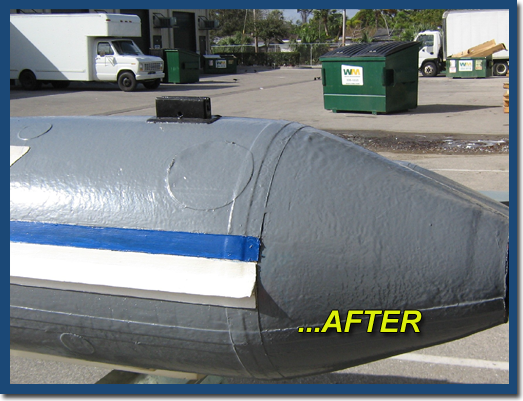 You may not want or need to paint your inflatable after you use Liquid Rubber to re-skin your inflatable. However, if you do want to paint it you should use our Top Side Paint. Our Top Side Paint is mixed with our Sealant to provide an extra bond and seal for your inflatable. Elasticity is important when painting an inflatable boat and Inland Marines Top Side paint exceeds these requirements. Your inflatable boat will expand and contract when it is exposed to the sun and shade. If the paint you use does not have the elasticity to adjust to these changes it will crack and peel. We provide Top Side Paint in seven (7) colors so you can paint your boat or creatively make it unique and easier to find when in a busy port of call. See more details here about Top Side paint.